You're at the barbecue, about to cook for your hungry guests and looking forward to an evening of good food and great company. The preparations have been made, your guests are engaged in lively conversation around the table, all you need to do now is barbecue the food... You lift the lid and... oops, the cooking grate is still dirty from last time. There's no need to worry, cleaning the cooking grate is quick and easy, all you need for a basic clean is a good grill brush, cooking oil, a hot barbecue and 15 seconds. We'll show you just how easy it is. You'll find tips for a more thorough clean throughout this page. Happy barbecuing! The first time you cook on your new barbecue you should clean it thoroughly using hot water and mild soap. The cooking grate should be thoroughly 'burnt off' before you start. To do this turn the heat right up. Dip half an onion in cooking oil and rub the onion onto the grate using a barbecue fork. Close the lid and leave the grill to stand for 15 minutes. It may smoke a lot. Always clean your barbecue while it is hot. This saves time and unnecessary wear on your grill brush. Spend 10-15 seconds brushing the hot grate clean and leave to dry naturally. Use a solid grill brush on the grate and wipe it at the end using a damp cloth. Some grill brushes may only be used on the grate, and not on the interior of the grill. You can use folded metal foil here instead. You should generally only use grill brushes with stainless steel or brass bristles. If some surface rust appears on the welded joints on your grill, you can easily remove it using non-acidic oil (WD40). It is a good idea to regularly apply a little non-acidic oil to the extra welds on your barbecue. Then polish using a dry cloth. Note: NEVER use non-acidic oil inside the barbecue! Clean the exterior surfaces of the barbecue using soapy water and a wrung cloth. Then polish using a dry cloth. Weber's kettle barbecue and large coloured gas barbecues are not painted-they are porcelain-enamelled, Yet after extended use, flakes may appear on the inside of the lid which fall off. These are not paint, but charred fat residue which does not have to be removed. Yet it can be removed if desired by thorough cleaning, with hot, soapy water. Cast iron products need a little bit more TLC because it is susceptible to rusting. The care required is quite straight forward though you will be glad to hear... Always apply oil to your cast iron grate after each use and occasionally pamper your grate by immersing it in scalding, soapy water. Place it back on the gill and give it full heat for 15 minutes. The remaining grime should now be charred and can be scrubbed off using a grill brush. Apply a complete layer of cooking oil afterwards to protect the grate against rust. For storage, follow the usual steps but once dry and cooled, apply a layer of solid vegetable fat such as Trex. Wrap in kitchen paper or newspaper and pop in a kitchen cupboard. The burners at the base of Q® and gas barbecues need to be cleaned occasionally. Turn off the barbecue, let it cool, and then brush the grime off the burners using a clean grate brush. Regularly remove the layer of fat at the bottom using a normal kitchen scourer. Scrape it down into the drip tray so it cannot catch fire. Turn all the burners up to maximum heat Leave the grill to stand for 15 minutes. Allow the grill to cool. Remove the Flavorizer Bars and brush them with a stainless steel or brass brush. If you want to get them extra clean you can immerse the bars in soapy water, use a scourer to clean them, rinse thoroughly and wipe dry using a tea towel. Generally, you should apply oil to your food before you begin barbecuing instead of oiling the grill itself. This helps the food not to stick. However, if using a cast-iron grate, a safe and easy way to apply oil to the grate is to dip half an onion in oil and rub the onion onto the grate using a barbecue fork, so you avoid burning your fingers. This seasons your grate at the same time as oiling, Never use a basting brush, as the grill may flame up and the brush may melt. Never use olive oil as it may become rancid and give the food an unpleasant taste. If you want a perfectly clean grill you should use one of Weber's grill cleaner sprays to ensure an extra shiny surface. Different products are available to suit all barbecue models, to make cleaning easy. 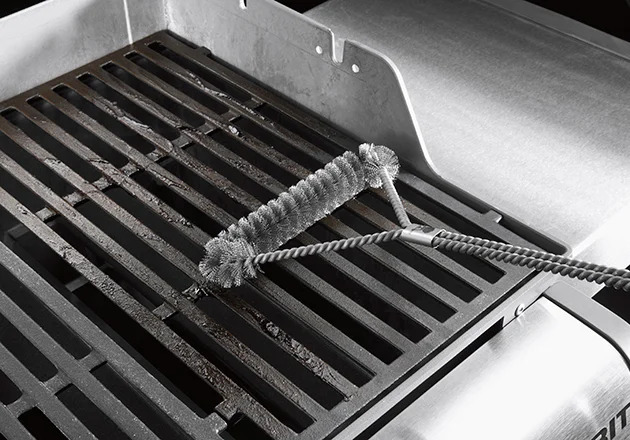 A grill brush is the most important tool when it comes to cleaning your barbecue. There are a variety to choose from, such as short brushes, long brushes, three sided brushes, etc. Look for stainless steel or brass bristled brushes, as other types risk damaging the grate and burners. Take a look at our Weber Grill Brushes here. Bacteria ls killed quickly in a barbecue due to the high temperatures, so there is no need to keep your grate immaculately clean. Food, cooked on a used grill actually tastes better than food cooked on a new one and the fat deposits on the lid help your barbecue form a better seal. Who doesn't like having a shiny barbecue? Spray the cleaner on a cold barbecue and leave for a few minutes, Rub any stubborn areas using a sponge or soft brush, then wipe away using a clean, damp cloth. Nothing beats the delicious grill stripes on steaks, burgers and chops that you get from a clean cooking grate. To clean, take the grate off the barbecue, spray on the cleaner and let it stand for at least 60 seconds. Grime will then be easy to remove. Rinse clean using hot water. Stainless steel can be difficult to keep clean, but using Weber's specially developed cleaner it's easy. Spray on the cleaner and allow to stand for a while dependant on how dirty your barbecue is. Polish thoroughly, then wipe clean using a hot, damp cloth. Keep your Weber Q® clean the easy way using Weber's specially developed cleaner. Spray the lid interior when the barbecue is cold and allow to stand briefly. Use a sponge or soft brush to remove grime, then wipe clean using a damp cloth.